Aleksey took his lessons separately from his sisters, although they shared many of the same teachers. The salaries of these teachers were divided among the children and paid out of each of their individual accounts. 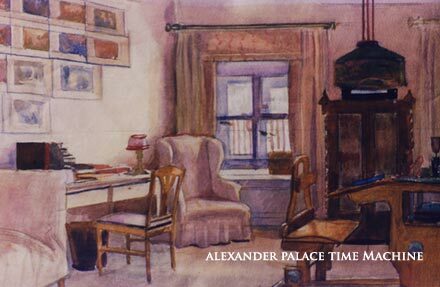 The watercolor above shows Aleksey's Classroom and dates prior to the closure of these rooms of the Alexander Palace Museum by the Soviet Government in the early 1930's. Here it can be seen Aleksey had an armchair placed in a similar window corner as in his mother's Mauve Room. This is where his father or mother sat when observing his lessons. Our thanks to the Directorate of the Catherine Palace Museum for the use of this image. In one of the the pictures above there are two desks, one is for the Tsarevich's teacher and the other is Aleksey's. Above Aleksey's desk hangs a wide fringed hanging lamp. On the wall behind the desk is a very large blackboard with an attached spotlight. Next to it is a map of European Russia, while a map of the entire Russian Empire hangs above the bookcases lining the room. On top of the bookcases are standing display cases containing collections of various items used in the instruction the natural sciences. These curiosities managed to capture the attention of the Tsarevich, who was easily bored in class. Instruction of the Tsarevich was a challenge to his teachers due to his ill-health, the frequent changes in residence of the family and the boy's general inattention to studies.